There are beekeepers out there who harvest honey from a single floral source called varietals or uni-floral honeys. Granted, there needs to be several acres of that single floral source, and the bees must be prepared to work the bloom at the very moment it is producing nectar. But what you get from this focused approach are honeys that have distinctive flavor profiles that resemble the flower and region from which the honey is harvested. Simply put, varietal honeys are poetry in nature. 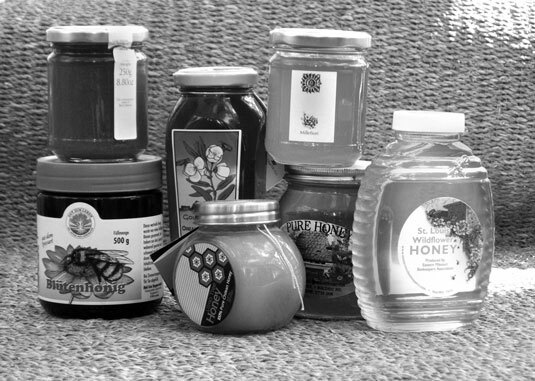 Here is a short list of some of the most popular varietal honeys harvested by beekeepers around the world. Acacia honey is commonly found in the EU. This variety is easy to identify because of its transparent pale yellow color. The flavor is sweet and delicate, with notes of apricots and pineapples. Alfalfa grown for hay to feed livestock secretly does not want honeybees to steal its nectar. So the plant has evolved to “spank” the bee when she tries to enter the nectary. This disciplinary action deters the bees and prompts them to chew holes into the side of the flowers petals to get to the nectar. Alfalfa honey is light amber in color with flavors of dry hay reminiscent of a barnyard and delicate spices. Avocado honey is produced in warm climates like Mexico, California, Texas, Florida, and Hawaii. These trees live for hundreds of years and bear a popular, edible fruit. The resulting honey is dark amber in color and somewhat bitter with smoky and nutty flavor notes. Locust trees bloom in early spring, showing off its highly aromatic clusters of white flowers. This honey is difficult to obtain because of its early bloom time. Conditions must be perfect for the bees to make this exquisite light-colored honey that has a green hue. Black locust honey is full of butterscotch and dried fruit flavors, enveloped in hints of warm vanilla. Blueberry Blossom honey hails primarily from Maine, Michigan, and Wisconsin. Blueberries are an all-American summertime favorite for pies and tarts, and the honey from the nectar in their blossoms closely resembles the berries’ favor, and sometimes even the color, depending upon where the honey was harvested. Look for full notes of jasmine flowers, berries, and hints of citrus. Buckwheat is one of the darkest colored and strongest tasting honeys you’ll come across. It has a powerful aroma that might give you second thoughts about tasting it. However, the chocolate, coffee, and a dark malty beer flavors will pleasantly surprise you. Delicious tasting, and great for baking. Chestnut is a true Mediterranean delicacy found in Italy, Spain, France, and around the EU. Blooms appear in June until July, yet the nut matures later in the season. Festivals are common to celebrate the dark earthy and sometimes bitter chestnut honey harvest. Clover honey can be found in just about every grocer and kitchen, because it’s the premier floral source for honeybees in the United States. The color of clover honey gets lighter the farther west it is harvested because the fields are vast with white and yellow sweet clover. Generally in the east, bees work only white clover. Clover honey is light, buttery, and delicate with notes of bee’s wax, green grass, and hints of vanilla. Fireweed is known as a colonizer plant because it’s the first plant to grow after a wildfire. Without other plants nearby, it is easy to harvest pure fireweed honey. Fireweed blooms in June and lasts until September and prefers the Pacific Northwest and Alaska. This honey is transparent and crystallizes slowly. Look for delicate flavors of pears, warm caramel, and brown sugar. Ling Heather hails from the moors of Ireland and Scotland. Ling honey is so thick that it must be hand-pressed from the honeycomb. When inside the jar, Ling honey becomes thick as jam until stirred to become liquid again. This thick-to-thin property is called thixotrophy. Only a few rare honeys exhibit this quality. It’s a dark honey with a red tint. The taste is bitter with deep earthy and smoky flavors. Lavender honey from Provence is a coveted treasure. The vast fields blanket the south of France, where everything is inspired by the scent of lavender. Light, delicate, and floral in flavor, you will be surprised not to find the same heady notes of camphor that are evident in the flowers and leaves of the plant. Manuka honey is world renown for its healing properties (especially regarding ulcers and intestinal problems). Manuka is the name for the tea tree, which grows in New Zealand and southeast Australia. Mostly taken as a medicine here in the United States, manuka honey will remind you of an alpine forest with its earthy, damp, and evergreen flavors. This honey granulates quickly; it’s also quite thixotropic and has a very high viscosity. Note: Because of the very high premium paid for manuka, much of the commercially available product labeled as manuka is not what it claims to be. New Zealand produces 1,700 tons of manuka honey annually (nearly all of the world’s production comes from New Zealand). But 10,000 tons or more of honey labeled as “Manuka” is being sold annually. That doesn’t quite add up! Linden or Basswood is a spring blooming tree found in the United States and also in the UK and EU (where it is referred to as Lime honey). Many city streets are lined with Linden trees offering city beekeepers a delicious harvest. Basswood trees are good nectar producers, producing a bold-flavored honey with notes of green fruit, menthol, and herbs. Mesquite is found growing in Texas, Louisiana, Arizona, New Mexico, and along the border of Mexico. The mesquite plant is cherished for its wood, which is used to add a smoky flavor to foods on the barbeque. This honey is medium amber with a warm brown sugar and a somewhat smoky flavor. Orange Blossom honey can be found in most tropical regions, predominately in Southern California and Florida in the United States. Florida’s orange honey is bright in flavor with an amazing burnt orange color, whereas the flavor of orange honey harvested in the west has a warmer flavor reminiscent of the sandy dessert. Sage shrubs are native to the United States and can be found along the dry, rocky coastline and hills of California. A medium-amber-colored honey, sage offers a distinct taste of the warm western desert with notes of brown sugar and a distinctly herbal finish. Sidr honey is considered the finest and most expensive honey in the world (expect to pay around $300/pound). With the highest amount of antioxidants, minerals, and vitamins, the best Sidr honey comes from Hadramaut in the southwestern Arabian peninsula. Beekeepers laboriously carry their hives up the mountains twice each year to harvest this dark, rich honey with flavors of dates, molasses, and green fruit. It’s the Rolls Royce of honey! Star Thistle is an attractive plant for honey bees and is found across the entire United States. The honey is yellow amber with a green tint. Star thistle has a spicy tang to its flavor with hints of cinnamon and molasses. Sourwood is sometimes called “mountain honey” because the tree is located throughout the Blue Ridge mountain region. A highly sought-after honey, sourwood is water white in color. It is slow to crystallize and has the delightful warm and spicy flavors of nutmeg and cloves with an ending sour note. Thyme is highly praised in Greece. It is also known as Hymettus honey, named after the mountain range near Athens. Thyme is a low-growing culinary herb with a pungent aroma. This honey is lightly colored with gentle notes of fruit, resin, and camphorous herbs. Tupelo honey has been immortalized in Van Morrison’s music and the film Ulee’s Gold, starring Peter Fonda. Often referred to as the champagne of honey, you’ll pay champagne prices for this rare variety that only grows in the swamps of southern Georgia and northern Florida. Tupelo honey is a delightful mix of earth, warm spice, and flowers. It rarely crystallizes.